I became uncomfortable the other evening, just after Wilhelm left my study, when I realized magic works best at night. I would like to think better of magic, seeing it happen in the full light of day. And it can happen that way, but magic prefers the night or at least the darkness of a dungeon, a cave, or the bottom of a well. In the Grimms’ version of this tale, the poor miller’s daughter is put in harm’s way—again as the motif will have it—by her father. This time he brags to the king that his daughter can spin straw into gold. The next day the girl is locked up by the king to perform this task before the morrow or die. Her life is at risk, not that of her false-worded father, who, having done his damage, exits the story. Imprisoned in a room filled with straw and a spinning wheel, the girl, naturally, sits down to cry, when through the locked door comes a “manikin.” We are left to decide if this is a dwarf, imp, or elf. It offers to do the spinning for a price. The pattern is set for three nights running, the price escalating from a necklace, to a ring, then to her firstborn. The reward also moves from not being killed to marrying the king. When payment comes due, the manikin reappears to collect the now queen’s firstborn son. Dickering ensues and, unaccountably, the manikin offers to relent if she can guess his name during the course of three days. The game is over, the queen has won, and Rumpelstiltskin, in a rage, tears himself in two, another of the Grimms’ messy endings. 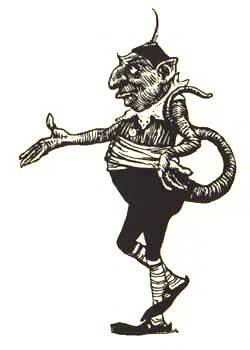 Although the story does not say so, all of Rumpelstiltskin’s visits appear to occur in the evening. The story certainly states he worked all night spinning straw into gold. This story serves as a typical example of magic happening at night. One might also recall the night shift of the shoemaker’s elves, Cinderella’s magic evening out, the prince of “Kate Crackernut” forced by fairies to dance every night to the point of exhaustion. Let us step back for a moment and view all of the fairy-tale landscape. Like churches sitting close to every village, magic appears in every fairy tale. If there is no magic, there is no fairy tale; a folk tale, perhaps, but not a fairy tale. What kind of magic? Usually black magic. White magic is the stuff of charms and wearing of garlic to ward off evil—invoking, asking magic. Black magic, for good or ill, is used to spin straw into gold—evoking, commanding magic. Now let us ask, why, historically, have we told stories of black magic to children? My answer is that it has nothing to do with the amusement of children. It has to do with the culture (church-dominated) wanting to diminish the reputation of black magic, along with its pagan associations. If relegated to children’s stories, it is no longer a thing to be taken seriously. The process of diminishing through storytelling happened to Fionn mac Cumhaill, the larger-than-life pre-Christian Irish hero, who became reduced through Christian tellers to a bumbling giant given to sucking his thumb. Fairy tales are a safe place for the culture to store magic. Still, it is not reputable and needs to be put, within the stories, in its proper place—in the dark, out of sight. 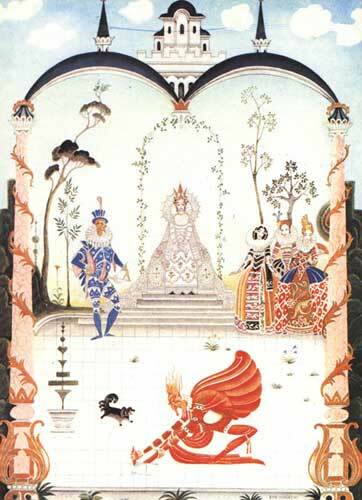 There is one element in fairy tales that is not typically shared with other forms of popular fiction, not even fantasy. Fairy tales have holes in their plots you can fly a dragon through. It is not uncommon for writers to take fairy tales as inspiration for novels, particularly young adult fantasy, Beauty, by Robin McKinley, being an example. One of the first tasks these writers face is the need to repair the plot so that it can sustain a work of novel length and complexity. In “Rumpelstiltskin” let’s consider the scene between the manikin and the queen, when he comes to claim the child. I think we can safely assume he does not have a driving desire to take on responsibilities as a single parent. The closest we come to his intent is his statement: “…something living is more important to me than all the treasures in the world.” We are not told what he will do with the child, but we can guess it is nefarious. What is his motive for inventing the guessing game? There is nothing in it to profit him. It delays by three days his acquisition of the child. Is there pity in his heart? That would be out of character. Perhaps he is playing with the queen, but, plotwise, that is weak motivation. I’d call it, in a novel, bad writing. However, my self-proclaimed cleverness comes to nothing for solving this problem in our fairy tale. I am answering a question that doesn’t exist. Here is my point. We don’t expect fairy tales to have good plots. We don’t ask them to have good plots. We may not want them to have good plots. Fairy tales are “What if” stories, with tunnel vision, involving magic. What if you were asked—no, commanded—to spin straw into gold? That it cannot be done does not enter into consideration. All impossible tasks are accomplished in this genre. All sorts of conveniences are laid in the path of the protagonist. That servant of the queen just happened to hear the manikin singing his name as he danced around his fire. “And they lived happily ever after.” Isn’t that a huge cliché to stick at the end of the plot? Yet it’s one that we expect to hear, and crave to hear, in our fairy tales. We don’t want a reality check screwing up our fairy tales. Notice how the Grimms almost never put their stories in a given time or place. The only exception that comes to my mind is “The Bremen Town Musicians,” and those “musicians” never get to Bremen Town. I believe the magic in fairy tales does not come from the turning of straw into gold, but rather being freed from the shackles of solid plot and believable motivations. In a number of cultures, individuals have a name by which they are known, but also have a secret true name, often given to them at puberty. To know that name is to have the power to cast charms over that person. The contest between the queen and Rumpelstiltskin fell within the circle of a power struggle. The condition of the queen gaining control had always been there; the manikin simply made a game of it, never thinking she would find out his name through his own careless act of uttering it aloud. Then, rather than be controlled by the queen, he destroyed himself. I sat in my chalk circle contemplating the nature of secret names long after the spirit of Wiki had faded. Did I have a secret name and not know it? Could some other entity discover it and henceforth control me? No. We live in a modern civilized society, no longer given to superstitious constructions of reality that dictate the need for secret names to protect us from evil spirits or to control those same spirits. We have no need for secret names. Then the full horror came to me. I have many secret names! My Social Security number, my PIN number, my Visa card number, and my computer password (letters and numbers), any of which can be discovered. My chalk circle is dust; it cannot protect me. With that many secret names, is it only time until one of them is revealed? Shall I tear myself in two and join Rumpelstiltskin? I then understood how this tale relates to the modern world. Though written so long ago, it calls forth our present. “Rumpelstilskin” is the origin story of Identity Theft. PS. While researching I found the Grimms’ oral collected version had Rumpelstiltskin traveling about riding in a cooking ladle, an image the Grimms edited out of their printed version. I am going to have to talk to Wilhelm about that the next time I see him.